Brownells' retail store is the only place in the world where you can buy a firearm and nearly any accessory to customize it in the same transaction. Don't see what you need on the retail floor? Not to worry! There are nearly 100,000 more products in the huge warehouse right behind the door. Our staff would be happy to help you place an order from the warehouse and have it delivered to you in just minutes. We Buy And Trade Used Firearms! 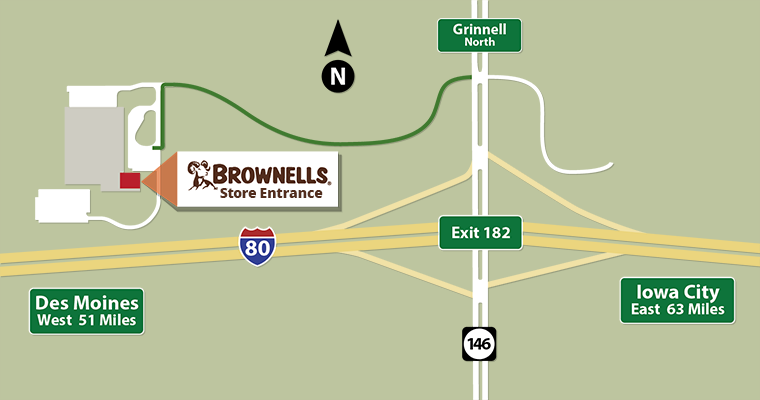 Selling or trading your firearm is simple at Brownells! Click Here for this location on Google Maps. *Store and Order Pickup hours are listed in US CST.